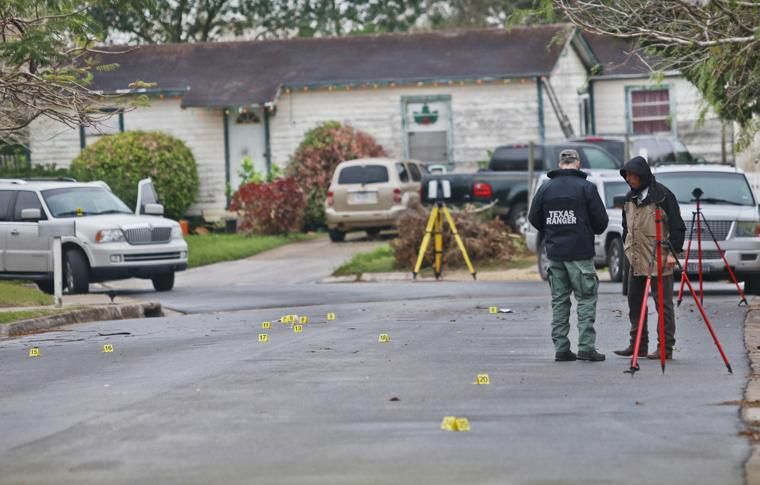 Bright yellow numbered evidence markers mark spots along Camelia Drive as Texas Rangers investigate the scene of a shootout in this undated photo in Brownsville. A man accused of triggering a deadly police chase that resulted in the death of his mother after he allegedly shot an off-duty Border Patrol agent he found with his estranged girlfriend is set for trial this morning. A man accused of triggering a deadly police chase that resulted in the death of his mother after he allegedly shot an off-duty Border Patrol agent he found with his estranged girlfriend is set for trial this morning. Jesse Garcia, who was left paralyzed from the waist down during the shootout with police in front of his mother’s house, is charged with murder, three counts of aggravated assault on a public servant and two counts of aggravated assault with a deadly weapon for threatening the off-duty Border Patrol agent and his estranged girlfriend with a handgun. During a Friday morning hearing, 357th state District Judge Juan A. Magallanes told Cameron County Assistant District Attorney Art Teniente and defense attorney Fred Kowalski that jury selection would begin immediately Monday followed by opening statements, unless both sides reached a plea agreement. Teniente and Kowalski estimated the trial could last from three to five days. Garcia isn’t accused of shooting his mother, but stands charged with setting in motion a series of deadly events resulting in the death of his mother. According to police, that deadly chain of events began when Garcia confronted his estranged girlfriend and her boyfriend, Raul Hernandez, the off-duty Border Patrol agent, on Jan. 26, 2016. Investigators say Garcia brought a gun with him and shot Hernandez in his midsection and then fled, setting off a massive law enforcement response to find the suspect. During the early morning hours of Jan. 27, 2016, police said Garcia engaged in a shootout with Cameron County Sheriff Deputies Mario Ledezma and Victor Hugo Alvarado, and Brownsville Police Department Sgt. Troy Allen Arnold. During the altercation, Garcia’s mother was shot and killed and Garcia was also shot. However, a federal civil lawsuit filed by Garcia and his brothers, Ramiro Garcia and Jose Luis Garcia Jr., against the City of Brownsville, the deputies and the officer, alleges the police used excessive force, which caused the death of their mother. That litigation paints a story that challenges the official narrative. According to the lawsuit, Garcia was unarmed when the domestic dispute occurred and Hernandez pointed a handgun at Garcia, who confronted the off-duty Border Patrol agent, resulting in a struggle over the weapon that ended with Hernandez sustaining a gunshot wound to his midsection. Both sides agree that Garcia fled and eluded police officers for hours before the shootout in front of his mother’s house. Authorities say Garcia was armed, but the lawsuit questions whether that’s true. Those proceedings are on hold. “ The outcome of Plaintiff Jesse Garcia’s criminal trial will determine whether the Plaintiffs can proceed with this lawsuit against Defendants,” a joint filing by attorneys for the deputies, the officer and the city and Garcia states.